Everton lined up in a 4-2-3-1 system with Beckford coming in for Anichebe up front. Rodwell started in place of skipper Phil Neville who missed out with a mouth infection. 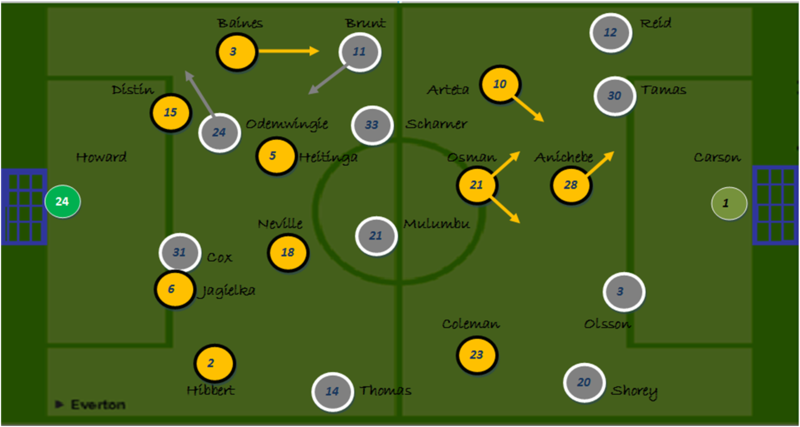 Chelsea played in their accustomed 4-3-3 with Mikel anchoring midfield and Torres deployed through the middle as the main striker. Baines has had great success against Chelsea this campaign but had a quieter afternoon in this fixture. The key tactical point here is that whilst Chelsea played 4-3-3 Essien was assigned the role to come across to the right side and press Baines when the ball was rolled out to him by Howard. This ploy did reduce Baines impact offensively with the newly crowned Player of the Year not making one successful cross all afternoon. This was a contributory factor to Howard opting for long kick outs too. Chelsea won 67% of the aerial duels, most of which coming from Howard’s long kicks up field. Whilst Jagielka and Distin took many of the plaudits for being rock solid – Distin in particular was terrific with a massive 11 clearances – Heitinga had arguably his best game of the season for the Blues. The fist waving Dutchman made a massive 7 interceptions and screened the back four really well. He also contributed 6 accurate long balls with the Ajax diagonal pass successfully deployed a couple of times. A key point in the game was the Coleman red card – the referee appeared to be swayed by the despicable card waving antics of Ashley Cole (dismissing the long standing myth that this gross act is only committed by foreign players) It was a sad way for Coleman to end the season – he has been terrific defensively and offensively and his displays against Chelsea in particular have demonstrated this – providing width and beating his marker twice as well as tracking Ashley Cole up and down the pitch. 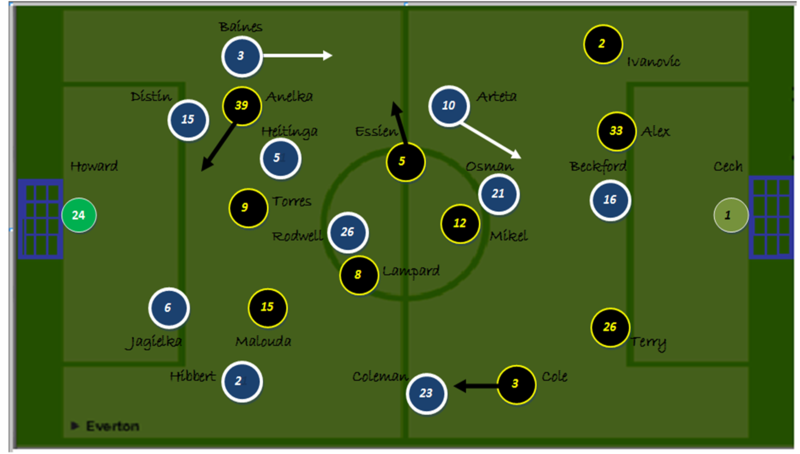 With Chelsea looking pretty blunt in the final third it appeared the game was drifting towards a 0-0 stalemate. Just as he did in the reverse fixture at Stamford Bridge though, Jermaine Beckford was to emerge as the Blue hero with a great solo strike. The forward’s display yesterday was quite erratic – as discussed on the blog earlier this season his game outside opposition 18 yard boxes is dubious with limited movement – but he does have great pace and a single minded attitude which is key for a striker. Having missed two 1 on 1 situations with Cech either side of the break Beckford made it third time lucky, running from the edge of our 18 yard box before hitting a sublime finish over Cech. A great win for the Blues against another top ranking side. Tactically it was the Blues positional rigidity and play off the ball which won the day here, along with some heroic defending at times from Distin and Heitinga. The Blues started in a 4-2-3-1 setup with Coleman coming in for Rodwell on the right wth Osman slotting inside. The Baggies brought back Brunt and Scharner in their accustomed 4-4-2. West Brom focused attacks down our problem left side, with Odemwingie making some great runs from the centre into pockets of space in behind Baines, catching Distin on the hop with great regularity. Distin is a massive unit and has been an ever present for the Blues this campaign, and whilst he has done a decent job I feel the praise he receives is sometimes overstated. For the 3rd game out of the last 4 he was directly culpable for a goal; at Man Utd his rash error left the backdoor open, last week a rash lunge opened the door for Silva and today some comedy defending gave the impressive Odemwingie the chance to tee up Mulumbu to give the midfielder back to back scoring games against the blues. Distin isn’t the only factor behind our defensive fragility this season, but he is certainly a contributory factor. 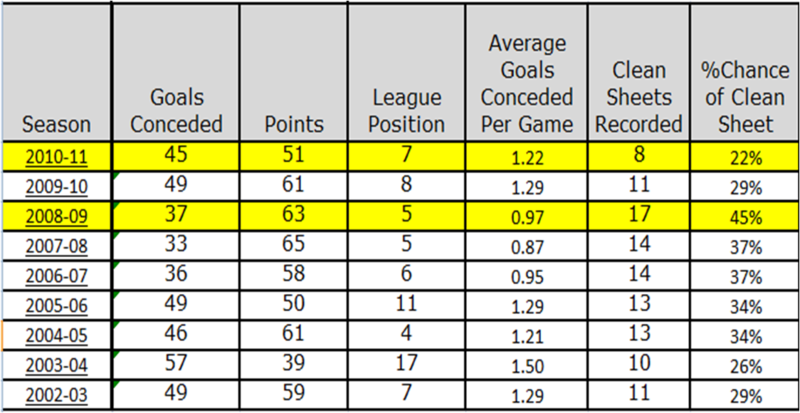 Everton were really sloppy throughout and WBA were first in most 50-50’s on the deck and in the air >winning 67% of the aerial duels to the Blues 33% and also winning 62% of their take on’s of opponents – the Blues in comparison succeeded with just 36% with Coleman failing with all 3 of his attempts to beat his man. The Blues again opted for Victor Anichebe up top, but surely after his woeful campaign the much maligned striker’s Goodison career is coming to an end. Anichebe has now recorded just 2 goals in 43 Premier League outings. There is no witch hunt here, I can see what he brings to the team in terms of physicality upfront and I have nothing against the kid, it’s just that he isn’t a Premier League striker; he simply doesn’t possess any goal threat whatsoever. I can see the use in him being deployed at Old Trafford in games when its hard to get possession in opponents half and his presence can bring midfielders into play, but against a West Brom side who are on a Premier League record run of not keeping a clean sheet in their last 17 Premier League home games and with the ball penetrating their 18 yard box at regular intervals, this was a game a player who comes alive in the box such as Jermaine Beckford should have started. It was more woe for the Blues here in a game which rounded our away campaign off in a remarkably symmetrical way – back in August an equally limp and feeble effort resulted in a 0-1 reverse at Blackburn. On a positive note the season ends next week.